The Droid Incredible‘s stock caught up some time last week for the first time since launch and it appears to be holding strong. We’re not sure if that is a good thing or not to tell you the truth though. Why do I say that? 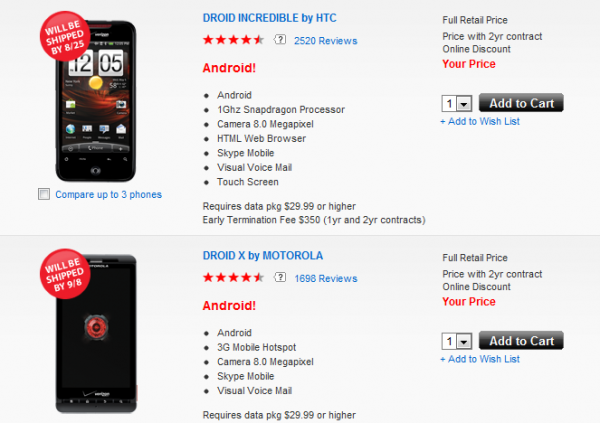 Well, because the Droid X replenishment date seems to be getting pushed back by the day and now shows “9/8″ as the next available shipping time meaning people are still willing to wait for the 4.3” destroyer and not for its Sense-friendly brother. While this isn’t anywhere near the delays we saw with the DI, it’s still unfortunate as it remains the top seller in the Droid family. What is actually a little mind-boggling though, is that neither have officially received Android 2.2 yet. (Any plans for that Big Red?) The only devices currently with Froyo are the original Droid which can no longer be purchased and the Droid 2 which lacked any sort of campaign to push it onto people other than geeks like us. Catching up on stock is one thing, now can we focus on at least getting these devices some up-to-date software?